So my good friend the Lattice Sampler, which began as part of the Stitch Fun series, is almost finished. On the one hand, this is a good thing, because I find it distracts me now and then. On the other hand, this is a bad thing, because I find I like to be distracted by it. I wish I had more hands. You know, when I look at this sampler, I don’t see it as any great piece of embroidery. The fact is, it’s not. It’s not well designed or even (gasp, horror!) that well executed. There are parts that could have been more precisely stitched. So it’s certainly not meant to be any kind of masterwork. 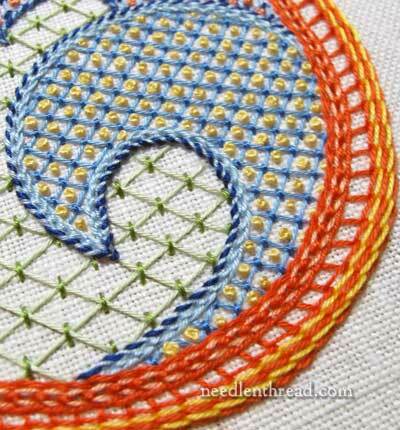 It is just meant to be fun, and to be a teaching tool for demonstrating some stitches. And I think it served its purpose pretty well. I am happy, though, that folks like it – and the concept behind it – enough so that several guild groups and individuals have asked permission to use it as a stitch exploration sampler. By all means, you are most welcome to do so – that’s what it’s for. I’ve contemplated putting together a “stitch map” of the piece, to make it easier for that purpose. But really, I recommend that you explore your own stitches and variations on it, rather than copying mine to the letter. That’s the point of the exercise, more than anything else. What’s different about the sampler since last time we looked at it? Primarily, its the background areas. The larger backgrounds have all been filled in with green lattice work. What remains to be stitched? Just this left side of the sampler and a couple little blank areas. The round blank areas will remain blank. One discovery I made while working on this piece is that I really love the whipped and laced chain stitch and its many variations. I think whipped chain stitch is an underrated and underused stitch, and I can see using it in several applications down the road. My favorite stitch, though, on the whole sampler is in the photo above. Is it the bright reddish orange and yellow raised stem stitch? Nooooooo. 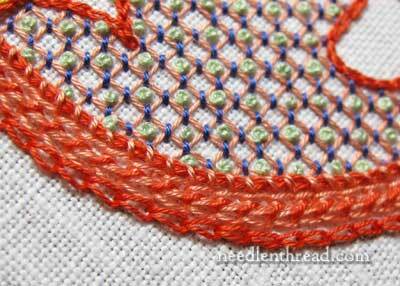 Is it the interlaced chain stitch in the reddish orange and salmon? Nope! Not that, either. It’s the twisty braid combination around the blue swash. That’s Hungarian braided chain stitch in light blue, whipped on the outside edge with dark blue. That’s a good combination, and another one I’ll most likely employ down the road somewhere. Next time we look at the Lattice Sampler, it may very well be finished! But that depends on whether or not I come to loose ends again and need some thinking time! If I stay organized and on top of things, it may be a while before we bid the piece a final farewell! 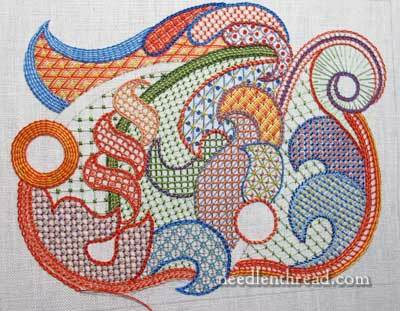 If you like playing around with embroidery stitches, feel free to visit the Stitch Fun index, where you’ll find tutorials for all the stitches used in this particular jumble, as well as the embroidery pattern used for this sampler. The Lattice Jumble Sampler Guide is available as a PDF download. It offers a complete layout with all the stitches, along with instructions and close-up photos of each section and the whole project. It’s been such fun watching this piece grow, Mary, and it looks good, even if you can see flaws – they’re not obvious to anyone else! I’ve also learnt a lot while watching its progress – thank you for taking us on this journey. It’s been a real, practical, working sampler; so surely it should be finished off with your initials in one circle and the year in the other circle, shouldn’t it? (You could use white thread if you don’t want them to be too conspicuous. )And you should be very proud of it. Mary, you may not think this is a masterpiece, but I certainly do. I think it’s so cool looking. Absolutely love it. How beautiful and so inspiring too! I have loved following the journey of this piece. I love colour and this does it for me. Thank you! It’s surprised me, which it shouldn’t I know, how well the bits and pieces have come together as a whole. It’s kind of a bit strange in one way but then delicate and lovely in another. I like it. “Investigation into killer needlework hands executing a body of embroidery work”!! And with that cheerful ending I’ll say, Catch ya later! Kath. I have really enjoyed following this piece. I totally agree with Sue Jones about initialing and dating this piece. Love this so much. 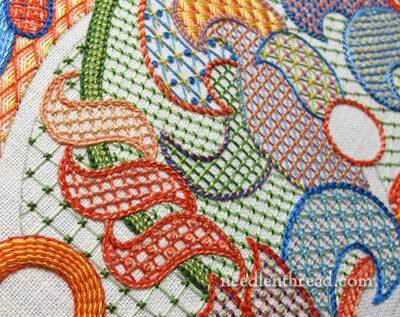 Sincere thanks for sharing so many of your embroidery tips with us. I love it! Mary, please do create a stitch map! It will be a place to start and reference. Variations and color choices will make it our own. This project is still looking gorgeous, Mary. I hope (hope, hope, HOPE) you give it away to a luck blog reader. Watching this piece progress – each new stitch – each close-up image – I can’t tell you how much i have enjoyed the journey. So much to learn and play with here. And I know exactly how I will be trying some of them out!!! I can’t begin to thank you for all you have shared in this series. I like it a lot, a lot of work, inspiration, colors, texture. It is a master piece, an abstract embroidery art. It should be framed. This is interesting to peruse. My favorite part is the tippy top left corner with orange and yellow lattice work outlined in blue. It reminds me of a beautiful fish tail. Wow, you’ve really aced those arabesques Mary. My fav bit is the “fiddlehead” spiral in the top right-hand corner. A really interesting design solution and very pretty. Mary…this is a wonderful piece! I feel so thankful that you have let us “eavesdrop” on your thoughts as you have created this piece. 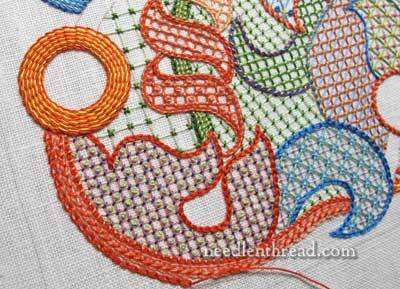 You have shared such great ways to “try out” different stitches for all of us to watch. You are a real inspiration! Many thanks for sharing! Thank you so much for taking us on this journey. I haven’t done any of this work before, but have enjoyed watching this piece grow so much that I have added it to the to do list! A stitch map would be a wonderful help. I am not a very good stitcher BUT I love to look at what you are working on. I am a painter and when I retire I would like to do more stitching. This one you call Lattice Sampler is just beautiful. I love it. I would like to do something like this someday. I enjoy getting your news letters. Hope you are well. I just purchased this e-book and I am excited to read through it. I think it will be a great way to learn couching in preparation of some day in the near future when I will do some gold work. I have sent a couple of emails, don’t know if they went through or not and I didn’t want to bug you anymore than I already do. I have had some computer issues and lost the alphabet sampler e-book on both my hard drive and external hard drive. I was in the middle of transferring all my files to the external drive when my computer went kaapooeee. It also took my external drive and lock it up so I now have to figure out how to unlock the drive without sacrificing 8 years of files. This is why I didn’t order this e-book last month when I said I would. I apologize for that. Is there a way I can download the alphabet sampler e-book again? I can give you the date that I purchased the pdf. Hi, Christi – no, I haven’t received any emails from you. Are you sending them to mary (at) needlenthread (dot) com? In any case, I’ll re-set that link and send it to you now. If you have any difficulties with it, please let me know. I downloaded the Alphabet sampler. I have read through the Lattice Jumbler and after reading it, I think I need to invest in some linen. I noticed that Hedgehog has the Alba Maxima back in stock, so I will order some of it next month. I am also going to pick out some colors for the Jumbler and purchase some cotton a brodor as you stated in the e-book it works best for that project. Thank you Mary, I hope you are feeling okay and everything is going well for you. You have been in my thoughts and prayers every day. Hi, Christi – I’d look for tutorials online for tracing in Inkscape. I just don’t have the energy right now for extra little tutorials on things like that, or I’d go into more detail. I did just get your most recent email – thank you! I’ll reply when I have a chance. Had to take my dad to the hospital last night, so it looks like I won’t be getting much correspondence done this weekend. But when I get a chance, I’ll do my best to answer your questions. I hope he’s going to be okay! Don’t worry about answering this question. I didn’t want you to write a tutorial, you actually did answer the question on what to look up and search for. I am sure there is an Inkscape message board somewhere that I can find if I get stuck. I want to learn the program more in depth anyway, so doing some tutorials might be in order. I saw you do something similar on the “Late Harvest” project when you figured out the size of the embroidered objects were the wrong size and you traced and resized them. That’s where I came up with the idea of just using a photograph to trace some images of wild life and needle paint them, eventually. All of us here at Needle n Thread are here for you. Take as long as you need as family is more important than anything else in the world. Just remember to take care of you, eat right and get plenty of rest. When crisis happens, when tend to run on adrenaline and focus on the situation at hand and fail to take care of ourselves. You and your loved ones are in my thoughts and prayers. If you need anything, just let me know. You have given so much, it’s time for us to give back what you have so freely given.